The following resume of the life of Ahmed Hassanein is from the Introduction by Michael Haag to the American University in Cairo Press' edition of The Lost Oases. In The Lost Oases, one of the great classics of desert exploration, Ahmed Hassanein tells how he set out by camel from Sollum on the Mediterranean coast of Egypt west of Mersa Matruh, heading for the oases of Siwa and Kufra and into the unknown. 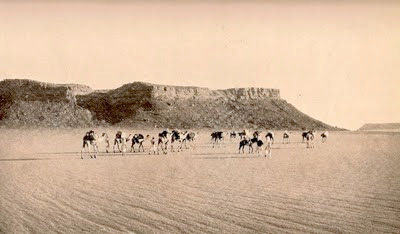 The first man to cross the Libyan Desert, as the eastern Sahara is called, his perilous eight-month journey in 1923 was to take him round the western shores of the Great Sand Sea to El Obeid in the Sudan, a distance of 2200 miles, and lead him to the discovery of the lost oases of Arkenu and Uweinat at the extreme southwest corner of Egypt. At Uweinat, Hassanein was amazed to find rock drawings of animals, including lions, giraffes, ostriches, gazelles and possibly also cows. He was deep in the trackless desert, but what he had found, and photographed, was evidence of a flourishing human existence ten thousand years ago before desertification drove these mysterious people to the valley of the Nile. Hassanein’s discovery – and indeed the pages of this book – excited the imaginations of later explorers such as Ralph Bagnold, who relied on convoys of stripped-down Model-T Fords (and who in the Second World War would create the Long Range Desert Group, the forerunners of the SAS), and Count Ladislaus Almásy who did his exploring by light aircraft and was the model for the eponymous character in The English Patient. But the significance of Hassanein's adventure and the achievements of his life amounted to a great deal more than that. 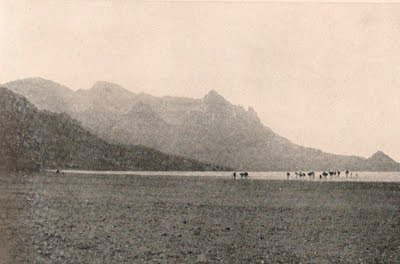 Hassanein's caravan approaching Arkenu early in the morning. After returning from his remarkable journey across the desert and his discovery of the lost oases in 1923, Hassanein was offered $20,000 by American promoters if he would go on a lecture tour round the United States dressed in his Bedouin robes. The press in America had already dubbed him Egypt’s Lawrence of Arabia; Rudolph Valentino’s film The Sheikh had been big box office two years before; and the world was still agog at Howard Carter’s discovery of Tutankhamun’s tomb in 1922. Egypt and deserts were the stuff of sensation and romance, and Hassanein was a hot property, a popular yet mysterious figure to the newspaper reading public in Europe and the New World. But Hassanein turned down the offer, saying that ‘my standing precludes earning money in such a manner’. And when he did go to America in 1924, it was in an entirely different capacity. Approaching the hills of Uweinat. 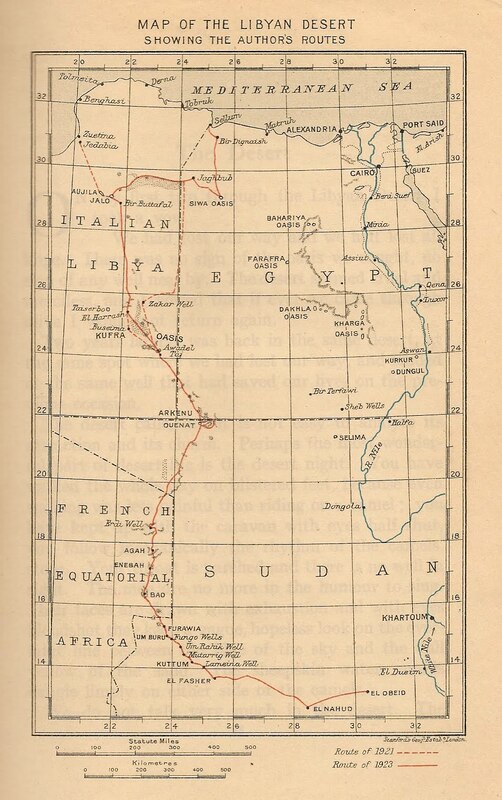 In Egypt, where Hassanein’s expedition was celebrated as a great advance in geographical knowledge and as a patriotic achievement, there was a sense of satisfaction that while Europeans had explored Africa by its rivers, it was Hassanein who first successfully penetrated the Libyan Desert, traversing it from north to south, and was the first to cross the Great Sand Sea. ‘The Libyan Desert is part of our country’, he had said before embarking on his journey, ‘and it is incumbent upon us to ascertain our borders there, so that we may better know our country. By traversing the desert I will have established some of the rights of our nation’. Now in August 1923, after returning from the desert, Hassanein addressed a grand reception in Alexandria of princes, ministers, senior officials and prominent men of letters. 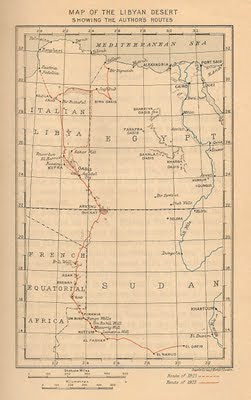 He outlined the scientific benefits of his expedition, adding that he had pinpointed precisely the geographical location of every area through which he had passed, not least the oases of Arkenu and Uweinat (Ouenat in Hassanein's spelling), making it possible to draw a detailed map of Egypt’s western territories. In November that same year in Cairo, Hassanein was feted with a large ceremony at the Opera House attended by King Fuad who conferred on him the title of bey. A member of Hassanein's expedition examines rock carvings at Uweinat depicting giraffes, lions, ostriches and possibly cows, indicating that the Sahara was once grassland and home to a sophisticated pastoral culture. 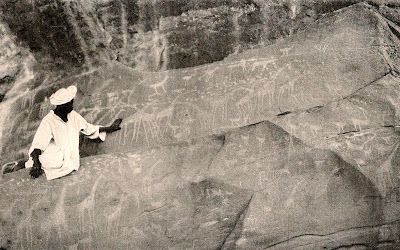 Yet Hassanein always understood that his greatest achievement was his discovery of the rock drawings at Uweinat; they were ‘the most interesting find of my 2,200-mile journey’, he would write in the September 1924 issue of America’s National Geographic magazine. He saw that they pointed to the passing of a sophisticated pastoral culture, the victim of dramatic climate change, which he placed at some time before the introduction of the camel to the desert in about 500 BC. But how much earlier than that, he could not guess, adding that ‘here is a puzzle which must be left to the research of the archaeologists’. 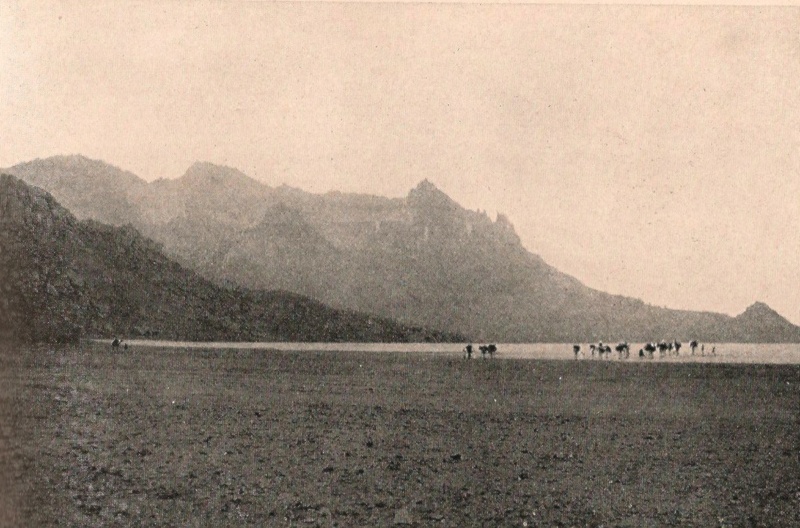 In The Lost Oases, published in the following year, he describes how he tried to hide his excitement at the discovery, and even avoided visiting some other rock pictures half a day away for fear of arousing suspicions among the native Tebu who thought of them as the work of jinns. In fact Hassanein had discovered the first prehistoric rock drawings ever found in Egypt’s deserts, the first evidence suggesting that Egyptian civilisation may have started in a once greener Libyan Desert and not, as universally supposed, in the valley of the Nile. As Michael Hoffman, the eminent prehistorian wrote in Egypt Before the Pharaohs (1979), Hassanein had ‘uncovered an archaeological mystery whose solution is only now coming within our grasp’. Hassanein would say that Bedouin blood ran through his veins, explaining the lure he had long felt for the desert. But he also belonged to the Turco-Circassian upper class, and by profession he was a diplomat who had asked the Egyptian Foreign Office for a leave of absence in order to undertake his expedition in search of the lost oases. Now that he was back, he was posted to the Egyptian embassy in Washington, where as First Secretary and still only thirty-three he held the number two position after the ambassador himself. Next he was sent to London, the plum overseas posting, where again he was number two, and where also he was awarded the Founder’s Medal of the Royal Geographical Society. He was recalled to Cairo in 1925 to serve as First Chamberlain to King Fuad, and for the rest of his life Hassanein remained close to the throne of Egypt, an influential and indispensable advisor, not least during the tumultuous years of the Second World War. Yet as a friend of Hassanein’s observed, ‘he would have preferred to have left behind the ceremonies, the trappings and the splendour to live in a tent in the desert. He loved the desert. It was like a garden of contentment for him’. 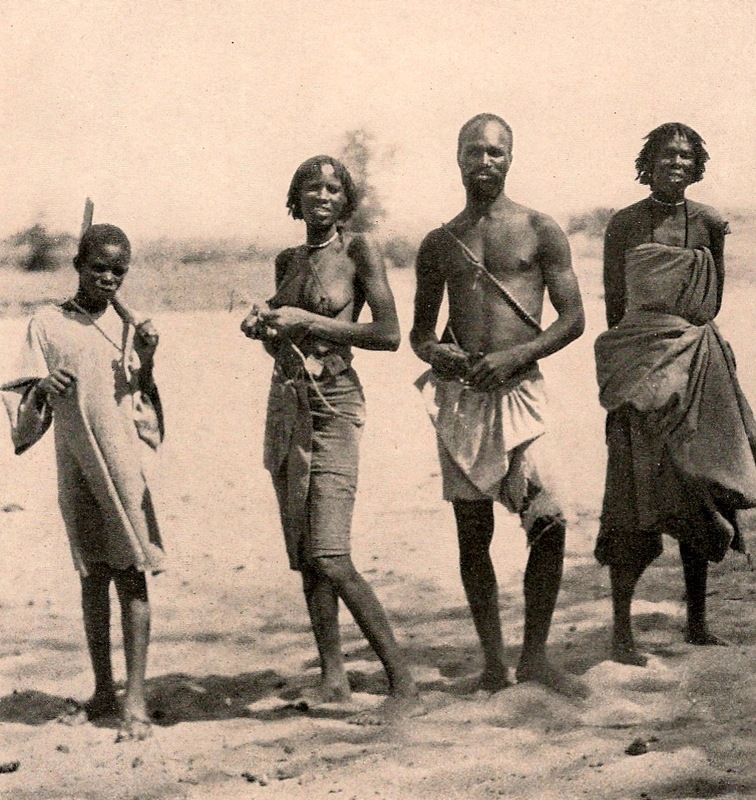 After discovering the lost oases Hassanein continued south into the Sudan where he photographed this Bidiat family in Darfur. Ahmed Mohammed Hassanein was born in Cairo in 1889, where his father, Sheikh Mohammed Hassanein el Boulaki, was a distinguished scholar at the thousand year old mosque of al-Azhar, which was also a university, the oldest in the world. His grandfather was Ahmed Mazhar Hassanein Pasha, the last admiral of the Egyptian navy before the British occupation in 1882. When ordered to hand over his fleet to the British at their naval base in Malta, admiral Hassanein instead sailed about the Mediterranean for a while before giving his famous reply, Malta mafish, ‘Malta is not there’. In his introduction to the 1925 edition of The Lost Oases, Sir Rennell Rodd loosely summarises Hassanein’s early education and career. Rodd himself was a diplomat and author, and had recently been ambassador at Rome and Britain’s representative at the League of Nations, while his son Francis, who was Hassanein’s friend from their days at Balliol before the war, had written The People of the Veil, a book about the Tuareg, which would be published in 1926. After Hassanein had studied for a year at Cairo’s Khedivial School of Law, his father sent him to Oxford University where he entered Balliol College in 1910, returning to Egypt in 1914 just before the outbreak of the First World War. There he joined the Ministry of the Interior and served as private Arabic secretary on the staff of Sir John Maxwell, Commander in Chief of British forces in Egypt. In 1917, together with Francis Rodd, Hassanein was sent on a delicate mission to the Senussi Bedouin who roamed on both sides of the Egyptian-Libyan border. Libya was then still notionally part of the Ottoman Empire, and the Senussi, armed by Turkish and German agents, were persuaded to mount attacks on Egypt’s western frontier, which required thirty-five thousand British troops under Colonel Milo Talbot to contain them. The Senussi were not a tribe, rather they were adherents of a fundamentalist Sufi sect who were militantly protective of their independence, but after their defeat in battle, it was the negotiations in which Hassanein, a fellow Muslim and son of a holy man, played an important part that led the Senussis to adopt as their new leader Sayed Idris, who was friendly to the British and their allies. This mission to the Senussis was the practical beginning of Hassanein’s long-cherished dream to penetrate to Kufra, the capital of the Senussi sect deep in the Libyan Desert. As Hassanein explains in the first chapter of this book, no outsider had penetrated as far as Kufra other than the German Gerhard Rohlfs in 1879, who was nearly killed in the attempt and had all his instruments and scientific records destroyed. With the war now over, Hassanein met again with Sayed Idris, and drawing on the earlier trust established between them, obtained his authority and permission to make the otherwise impossible journey to Kufra. 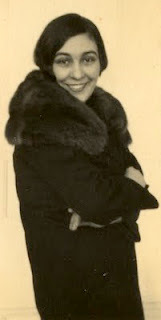 Francis Rodd planned to join Hassanein in the adventure, but when he was obliged to drop out, his friend the travel writer Rosita Forbes, a beautiful and vivacious divorcée in search of exotic adventure, pressed her chance. Hassanein cajoled a reluctant Sayyed Idris into allowing the Englishwoman to accompany him on the journey. Disguised as ‘Khadija’, she ‘dressed as a Muslim woman and posed as a female relative of mine, thus ensuring that the Bedouins could not address her or ask about her’. On several occasions they came close to being murdered by suspicious Bedouins and were saved only by Hassanein’s coolness and quick wits. Once they were challenged at Jalo, where they were asked about some merchants in Cairo to see if they really were Egyptian. Fortunately Hassanein had the answer, and their caravan was given the traditional Bedouin hospitality. At another point, north of Kufra, their expedition missed a vital well owing to Rosita’s lack of skill in taking compass readings, and they nearly died of thirst. 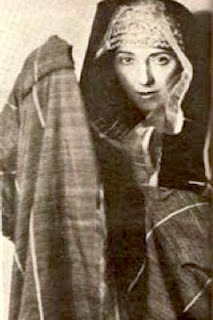 Hassanein was badly repaid for the effort and risks he took on Rosita’s behalf, for as soon as she returned to England she wrote The Secret of the Sahara: Kufara (1921), in which she represented herself as the sole organiser and driving force behind the expedition, and described Hassanein in terms that suggested he was nothing more than her hired servant. The book won her the reputation of being an intrepid explorer and made her famous throughout the world. But as the explorer and Arabist Gertrude Bell wrote at the time, ‘in the matter of trumpet blowing she is unique’, adding that ‘she doesn’t know a word of Arabic’, and that without Hassanein ‘she couldn’t have done anything’. Even Rosita’s entry in the Dictionary of National Biography, not normally given to critical remarks about its subjects, says that her book ‘decidedly under-played her companion’s share in the expedition and gave rise to resentments which long persisted’. Rosita Forbes in desert costume. Or maybe something did happen between them, but if so then it would seem that Rosita’s false compass readings chastened Hassanein’s desires. ‘On my first trip through the Libyan Desert I took a vow’, Hassanein writes in The Lost Oases. ‘We had lost our way and we had lost all hope. There was no sign of the oasis we sought, no sign of any well near by. The desert seemed cruel and merciless, and I vowed that if ever we came through alive I would not return again. Two years later I was back in the same desert, at the same spot where we had lost our way, and landed in the same well that had saved our lives on the previous occasion. The desert calls, but it is not easy to analyse its attraction and its charm.’ And again, describing his love of the desert: ‘It is as though a man were deeply in love with a very fascinating but cruel woman. She treats him badly, and the world crumples in his hand; at night she smiles on him and the whole world is a paradise. The desert smiles and there is no place on earth worth living in but the desert.’ But not if you are with a woman who does not know how to read a compass. Clearly Hassanein still had his mind on crossing deserts, but he would never undertake such an expedition again. 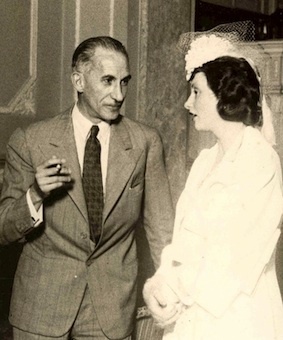 In 1926 he had married Loutfia Yusri, a beautiful and stylish woman whom he had met in Washington when he was First Secretary to her father, Seifallah Yusri Pasha, Egypt’s ambassador to the United States. Her mother was Princess Shevekiar, a woman of immense wealth whose town house in Cairo was of such gigantic proportions that it now houses the Egyptian Ministry of Foreign Affairs. Shevekiar’s first husband had been Fuad, before he came to the throne; when he tried to confine her to his harem quarters, she escaped and divorced him. Hassanein’s recreations included fencing, and he had fenced for Egypt in the 1920 Olympics at Antwerp. 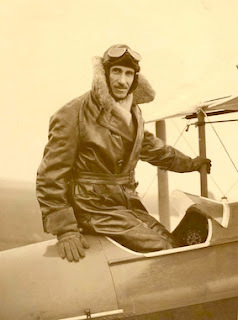 Now he took up flying, and in 1930 he attempted to become the first person to fly solo from Europe to Egypt. After taking off from Heston Air Park near London he got as far as Pisa where he smashed up his machine on landing. A replacement aircraft was put out of action by an accident at Naples, and when he was offered an Italian aircraft in its place, that crashed during a trial flight, killing its two occupants. At that point King Fuad lost patience with Hassanein and ordered him back to Cairo where the palace relied on his presence. He was also valued for the diplomatic bridge he created between Britain and Egypt, the British government honouring him with a KCVO (Knight Commander of the Victorian Order) in 1927, so that he was now Sir Ahmed Hassanein. But as a secret Foreign Office report on Hassanein made clear, ‘His knowledge of English and charm of manner leave many English people with the impression that he is unfavourable to Egyptian national aspirations. It would be a mistake to act on this assumption’. Hassanein en route from London to Egypt. After the death of King Fuad in 1936 and the accession of the sixteen year old Farouk, Hassanein was elevated from bey to pasha and was appointed governor of the Royal Household, by which he became responsible for the upbringing and education of the king. Both measures were instigated by Fuad’s widow, the still youthful and attractive Queen Nazli. By the terms of the Anglo-Egyptian Treaty signed in the same year, Egypt accepted a military alliance with Britain in the event of war but otherwise achieved total control over its own affairs. But that did not prevent Sir Miles Lampson, the overbearing British ambassador, from patronising ‘the boy’, as he routinely referred to King Farouk. ‘I quite realised’, said Lampson when Farouk ascended the throne, ‘that in the next little time things were going to be extremely difficult for the young King and that he was going to feel the want of someone to lean upon.’ But the more Lampson pressed himself on ‘the boy’, the more the king rebelled, and instead it was Hassanein that Farouk admired, almost to the extent of hero-worship at times, trusting him, imitating him, but fearing him as well. He was the only person able to speak to Farouk with entire frankness and sometimes he was blunt, but he always remained entirely loyal to his king. Edward Ford, who was Farouk's English tutor, wrote of Hassanein at this time: ‘I sit next to him for most meals and his reminiscences of Oxford are a delight to me. He has a quick wit, great courtesy, an interest in all subjects and is a quite unusual type of Egyptian. Slim, sharply featured, with a sallow colour and grey hair brushed straight back from his high forehead, he has an unmistakable Bedouin look. … He has keen penetrating eyes, never looks sleepy and has an air of refinement that the coarse looking Egyptian type entirely lacks. He has never had political inclinations, and, though he is a firm believer in Egypt's right to govern herself and a fervid Moslem, he is quite without that aggressive conceit which marks other ambitious men in this country. Although his culture and his intellect are occidental, his mentality and nature are from the east. He has an eastern courtesy, and, in conversation, an eastern way of leading you off the path you have selected by a sympathetic evasiveness’. 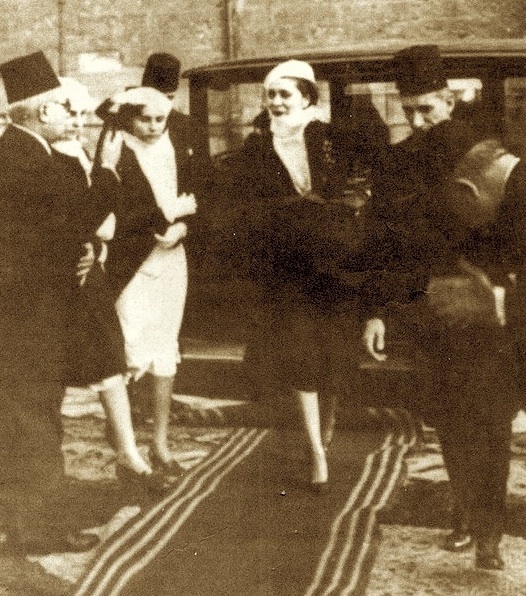 Hassanein accompanying Queen Nazli whom he secretly married. Meanwhile Hassanein and the queen fell into a romance, and after he divorced Loutfia amid a spectacular scandal, Hassanein and Nazli were secretly married in 1942 by Sheikh Mustafa el Maraghi of the Azhar. In June 1940 Italy entered the war. With large armies in Libya and Ethiopia ready to strike at Egypt, the Italians posed a serious threat, and the British demanded reassurance that the Egyptian government would not stint in honouring the provisions of the military alliance in the 1936 treaty. A former ambassador to Britain became prime minister, an anti-British minister of defence was dropped, the suspect and uncooperative chief of staff of the Egyptian army was dismissed, and Hassanein was appointed to the important post of the Chief of the Royal Cabinet, which placed him in direct liaison with Sir Miles Lampson, the British ambassador. The arrangements were made in time to meet the Italian invasion in September 1940, and when General Wavell counterattacked in December, Hassanein eagerly phoned Lampson to ask for news and was told of Wavell’s early success. ‘He expressed much gratification’, Lampson recorded in his diary, ‘and said that he would at once tell King Farouk. Hassanein is of course violently anti-Italian and he made no secret of his delight at their reported discomfiture.’ Which made it all the stranger that in February 1942 Lampson had Farouk’s Abdin Palace in Cairo surrounded by British troops and armoured cars and demanded the king’s abdication for supposedly being sympathetic towards the Italians. In fact Lampson, together with Anthony Eden, Britain’s foreign secretary, were playing a deeper game. Farouk was taking himself too seriously as an independent king of an independent Egypt, Lampson complained to Eden, and they wanted someone more malleable on the throne, as well as a prime minister of their own choosing. Lampson’s show of force so overawed Farouk that he was about to sign the abdication document, but then Hassanein intervened, and whispered something in the king’s ear. Farouk conceded the British demand over the prime ministerial appointment but contritely asked to remain on the throne, an offer that Lampson, caught slightly off-balance, accepted. From Hassanein’s point of view, and in this he probably would have found support among almost the entirety of the Egyptian population, it was right that the integrity of the monarchy be preserved, whatever the merits of its occupant. Certainly Lampson’s action provoked nationalist outrage at foreign interference, destabilised constitutional government and introduced a bitterness between Britain and Egypt that would culminate in the Suez debacle. 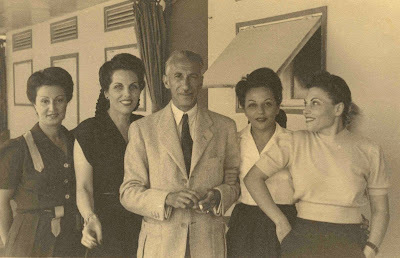 Hassanein with admirers in Alexandria in the 1940s. This photograph appears in Michael Haag's Vintage Alexandria. He was interred in Cairo’s City of the Dead, his remains placed in a domed mausoleum built by his brother-in-law, the outstanding Egyptian architect Hassan Fathy. After a lifetime that took him thousands of miles across uncharted sands, that opened up the remote ages of the past, and that seemed to belong more to a tale from The Arabian Nights, Sir Ahmed Mohammed Hassanein Pasha was laid to rest. He was only fifty-six.